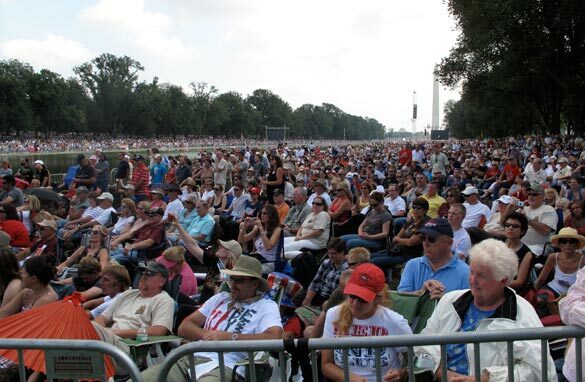 The Washington Post noted that Beck told the crowd that he had heard “it was between 300,000 and 500,000." And the Post quoted Rep. Michele Bachmann (R-Minnesota), speaking soon after the rally ended as saying, "We're not going to let anyone get away with saying there were less than a million here today – because we were witnesses." On the morning after the rally, Beck himself told Fox News Sunday that he believed the crowd was as low as 300,000 and as big as 650,000. CNN contacted AirPhotosLive.com about the estimate they did for CBS News. A company official told CNN they used photos taken from their tethered balloons to shoot photos at the height of the crowd. They then had 3 experts use their own methodologies to evaluate the crowd. Company officials said they extrapolated the crowd size from 2-D and 3-D grids of the photographs marked off in small boxes. Sarah Palin responded to the media reports on her Twitter page around 12:45 p.m. ET. "Silly media reports 'maybe thousands'@Beck’s 'irrelevant' event;insinuating MSM sheeple mustn't believe their own eyes&ears..." the tweet read. – Soon we will be celebrating the 50th Anniversary of the 'death' of the 'Dixiecrats', you know, those Democrats who now ashame the name of the party due to their openly and proud racists positions and when they realized that they were going to loose turned Republican? FIFTY YEARS AGO (sort of)? So, it was about the same size as a college football game. So, why is this considered NEWS. Tell me about the last Tennessee/Alabama football game in the same detail. I'm sure it outdrew the Beck crowd by twenty thousand. And was actually INTERESTING. @ricky Did you post the same comment during the million man march? I didn't realize that there were so many complete idiots in this country! I guess H. L. Mencken was right, "Nobody ever went broke underestimating the taste of the American public"! I love the "lemmings", etc. comments by Liberals. Go ahead, make yourself feel better. You haven't seen ANYTHING yet. If you seriously think that most people like how much has been spent, how much is yet to be spent, how big government is continuing to grow, etc., you need to be committed somewhere. I understand the anti-Bush rhetoric and hatred, but many many votes weren't necessarily for Obama or the Dems, they were votes AGAINST Bush. News flash: Bush isn't on the ballot this year, and people now have a choice. Come November, this country moves back from it's pathetic current lack of leadership.